Chimerism Analysis of Cell-Free DNA in Patients Treated with Hematopoietic Stem Cell Transplantation May Predict Early Relapse in Patients with Hematologic Malignancies. 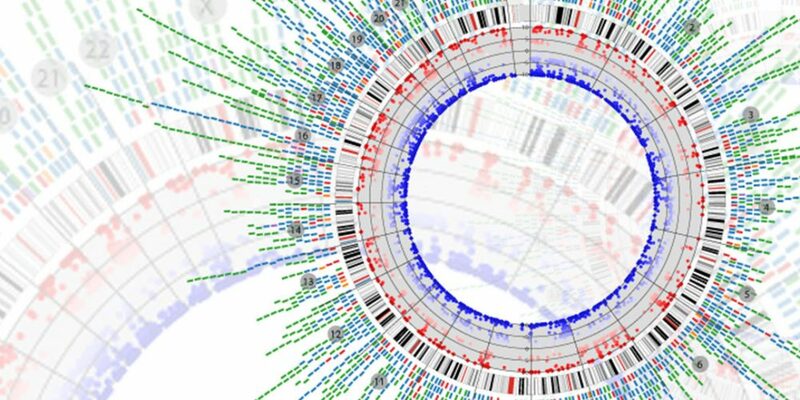 We studied DNA chimerism in cell-free DNA (cfDNA) in patients treated with HSCT. Chimerism analysis was performed on CD3+ cells, polymorphonuclear (PMN) cells, and cfDNA using 16 small tandem repeat loci. The resulting labeled PCR-products were size-fractionated and quantified. Analyzing samples from 191 patients treated with HSCT for nonneoplastic hematologic disorders demonstrated that the cfDNA chimerism is comparable to that seen in PMN cells. Analyzing leukemia patients (N = 126) showed that, of 84 patients with 100% donor DNA in PMN, 16 (19%) had evidence of clinical relapse and >10% recipient DNA in the plasma. Additional 16 patients of the 84 (19%) showed >10% recipient DNA in plasma, but without evidence of relapse. Eight patients had mixed chimerism in granulocytes, lymphocytes, and plasma, but three of these patients had >10% recipient DNA in plasma compared to PMN cells and these three patients had clinical evidence of relapse. The remaining 34 patients showed 100% donor DNA in both PMN and lymphocytes, but cfDNA showed various levels of chimerism. Of these patients 14 (41%) showed laboratory or clinical evidence of relapse and all had >10% recipient DNA in cfDNA. Monitoring patients after HSCT using cfDNA might be more reliable than cellular DNA in predicting early relapse. Copyright © 2016 Mahmoud Aljurf et al. 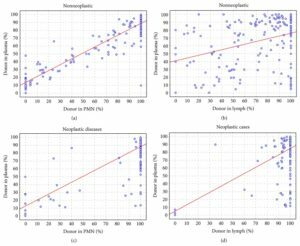 Comparing percent of donor DNA in plasma cfDNA with polymorphonuclear (PMN) and lymphocytes. 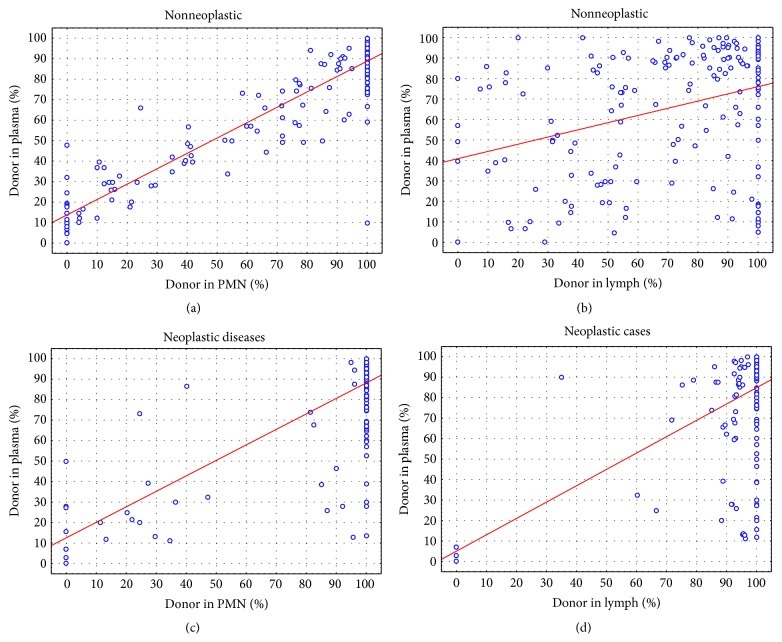 (a) cfDNA versus PMN DNA in patients with nonneoplastic diseases; (b) cfDNA versus Lymphocytes DNA in patients with nonneoplastic diseases; (c) cfDNA versus PMN in patients with hematologic neoplasms; (d) cfDNA versus lymphocyte DNA in patients with hematologic neoplasms. Chimerism pattern in a patient with CML treated with HSCT. Pretransplant and donor patterns are shown in the left panel. The middle and right panels show the patterns in PMN, lymphocytes, and plasma at two different points. The BCR-ABL fusion level as detected by RT/PCR is shown on top. The middle sample shows mixed chimerism in plasma only as well as residual BCR-ABL1 fusion RNA. The right panel shows the disappearance of the recipient DNA and fusion BCR-ABL1.